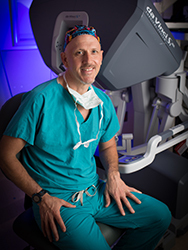 Dr. Boggess has developed a minimally invasive surgery program in Gynecology Oncology at UNC. Patients with invasive uterine cancer can be treated and staged using “bandaid” incisions which minimizes their recovery time significantly. Dr. Boggess continues to be actively involved in the comprehensive management of women with gynecologic malignancies and in the training of oncology fellows. Dr. Boggess is currently focused on developing a comprehensive cervical cancer prevention program at UNC. Over the last three years, Dr. Boggess, a practicing gynecologic oncologist, has been investigating novel biomarkers for cervical cancer development. With the addition of a digital colposcopy facility and a growing laboratory, Dr. Boggess has been able to succesfully complete a translational research protocol evaluating telomerase activity and cervical cancer development in 120 women with abnormal Pap smears. In collaboration with Dr. William Kaufmann of the Department of Pathology, Dr. Boggess is also investigating the genetic events which can lead to cancer and their relationship to oncogenic viral infection. This work has laid the foundation for collaboration with the Center for AIDS Research to investigate telomerase and cervical carcinogenesis in HIV infected women. Secondly, Dr Boggess’ lab is investigating the regulation of telomerase in endometrium and its potential role in endometrial carcinogenesis. Ongoing investigations looking at telomerase and PTEN and their roles in cancer development include both basic science and clinical translational programs. Dr. Boggess is a member of the Cancer Prevention and Control Committee, a branch of the Gynecologic Oncology Group (a national cooperative group funded by the NCI). Though his involvement with this committee, Dr. Boggess is helping develop treatment protocols for studying vaccination and medical treatments for cervical dysplasia patients. Dr. Boggess is involved on a daily basis with exposing medical students, residents and oncology fellows to the relationship laboratory science can have with clinical medicine and mentoring projects that seek to answer clinical questions with the help of epidemiology and molecular biology.